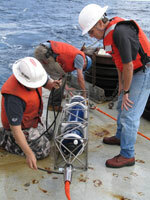 An ocean-bottom seismometer being deployed. USGS Photograph by Uri ten Brink. A female bottle nose dolphin performs her daily exercises while her trainer supervises. Image credit U.S. Navy. Brennan Phillips piloting a Remotely Operated Vehicle from the control room on a ship. Photo credit: ISC. Commercial divers build, repair, and inspect structures that are underwater. The commercial fishing industry includes any industry or activity concerned with taking, culturing, processing, preserving, storing, transporting, marketing or selling fish or fish products. 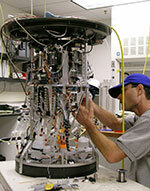 Deep-sea biologists are scientists and underwater explorers. Ichthyologists study all aspects of fish biology including anatomy, behavior and environment of fishes, how fishes interact with other organisms. Marine educators work in a variety of creative ways to teach people of all ages about marine science and ocean conservation. Marine mammalogists are marine biologists that focus on the study of marine mammals. Coastal Management Specialists use science, economics, and policy to study the physical nature, dynamics, and potential change of marine ecosystems. Ocean engineering is a combination of mechanical, electrical, civil, acoustical, and chemical engineering. Remotely operated vehicles (ROVs), are underwater robots that are tethered to a ship and piloted by a crew onboard the vessel. Geology is the science of the Earth, its composition, its structure, the process that act upon the Earth, and how those processes have shaped and changed the Earth over time. Marine seismologists map the Earth’s interior structure. The academic disciplines concerned with society and the relationships among individuals within a society (anthropology, economics, political science, psychology and sociology). Marine lawyers work on the laws and policies that govern ocean and coastal resources. Marine or underwater archaeology is the study of culture(s) related to human interaction(s) with the sea (as well as lakes, rivers, and wetlands).